I finally used up the last of the windfall Bramley apples I was given yesterday. I made three pots of compote for darling daughter no 2 to take back to uni, and my favourite oaty apple crumble. I love crumble in any form, but it’s even nicer with half oats and half flour, or even all oats in the topping. Brown sugar is especially good in this I think, but you can use the white stuff if you prefer it. put the oats, flour and sugar in a large bowl and add the butter or marg in small chunks. Rub it in with your fingertips until it becomes well mixed up and crumbly. Place it on top of the apple and press down gently. Bake in a preheated oven at about 180 degrees, gas mark 4, for 45 minutes until golden. Eat with a large dollop of custard or ice cream. 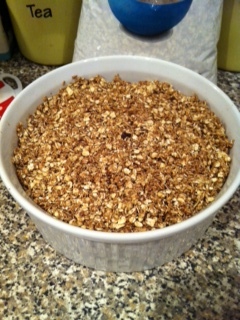 This makes quite a thick topping – you can reduce the quantities to 3 oz/3oz/3oz and 2oz if you prefer it a bit lighter. I have seen apples on sale for very little outside a few neighbours’ houses, but at this time of year you might be lucky to find them for free. You can make this oaty apple crumber with eating apples, but reduce the sugar by half. I have made apple and many other crumbles using oats and flour for a long number of years. My DGD presented with apple crumble by her mother announced, this isn’t apple crumble there are no lumps in it!!! My daughter had made it with just flour sugar and margarine, no oats.